Storage lockers are used in many organisations as a safe and secure way of storing personal belongings, clothing and equipment. 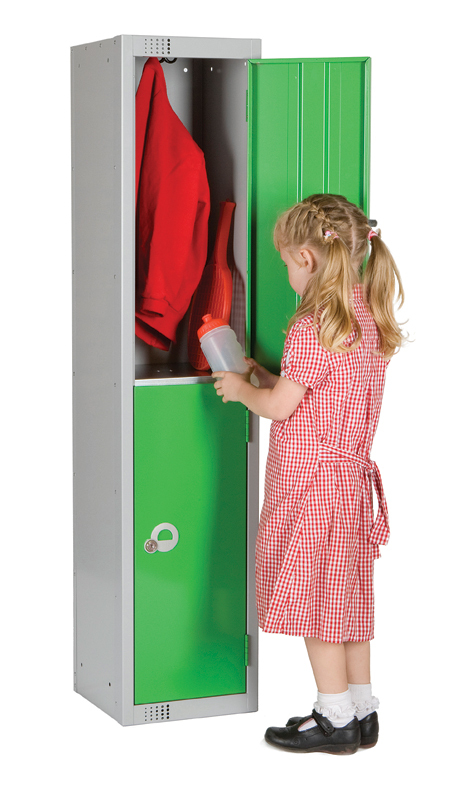 Lockers come in a range of shapes, sizes and specifications and can be used for different tasks. At G-Force Europe we offer a wide selection of storage lockers and industrial storage cabinets to cater for every application. Explore our range of Supertuff plastic lockers for a more durable alternative to steel lockers that can be used outside in any weather condition. 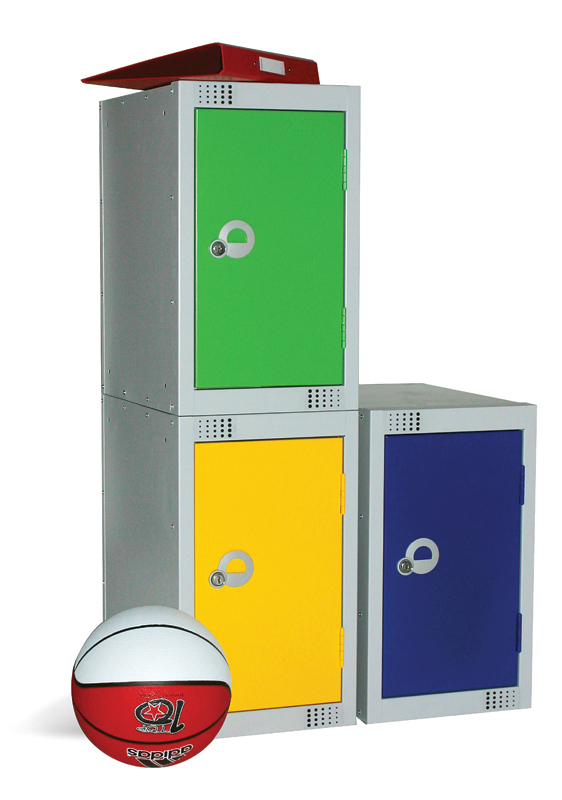 As an alternative to traditional steel lockers, we have recently launched our range of Supertuff plastic lockers. These are a moulded product produced entirely from incredibly strong and robust plastic, giving a hard wearing yet stylish storage solutions that offer many benefits. The material is water resistant and can therefore be used in wet and damp areas without the fear of corrosion. This allows them to be used in outdoor areas. Furthermore the durable nature of the plastic means that the lockers will not dent as the material offers great impact resistance. All in all the plastic lockers are a new option well worth consideration, they are an especially popular choice for schools as school lockers and high care factory environments for staff lockers. We also sell shelving and racking systems for industrial and commercial needs. This range of traditional metal lockers are produced from steel and are available in a wide range of different colours and sizes. 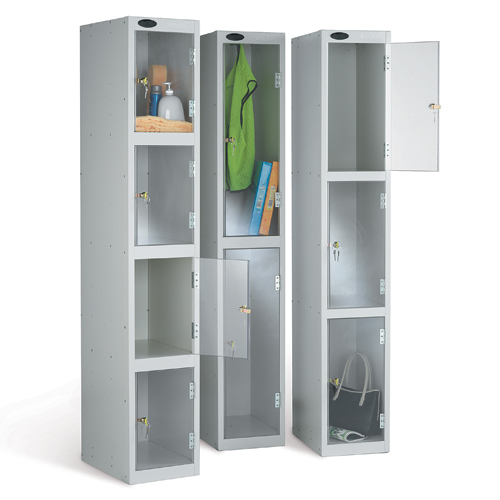 Our standard steel lockers are all a standard 1800mm height split with between 1 and 8 storage compartments. Steel lockers are commonly used fin factories and warehouses to schools, gyms and changing room. 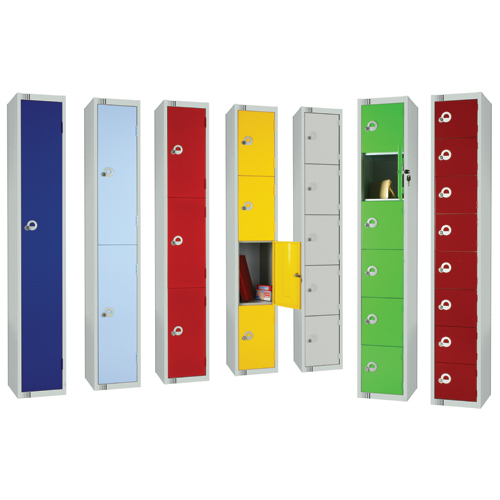 Our steel lockers can be supplied in 7 colours and with a choice of different locks. As well as the standard size lockers, we offer a range of modular units such as our cube and quad lockers. These are sold as individual storage compartments that can be combined as required. 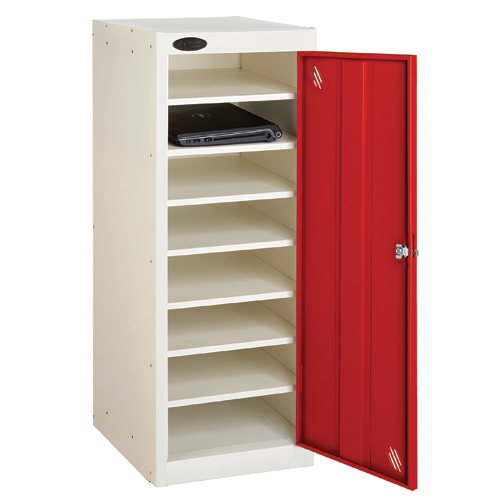 Where larger storage capacities are required we offer a range of personal staff lockers. They are designed to be used by staff providing them with hanging shelf space for equipment and clothing. 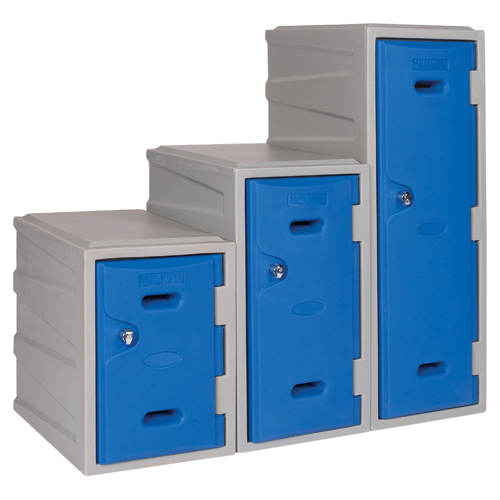 Personnel lockers are available in a number of different formats to suit different requirements. Cubes lockers are a great solution for storing small goods in a safe and secure storage locker. 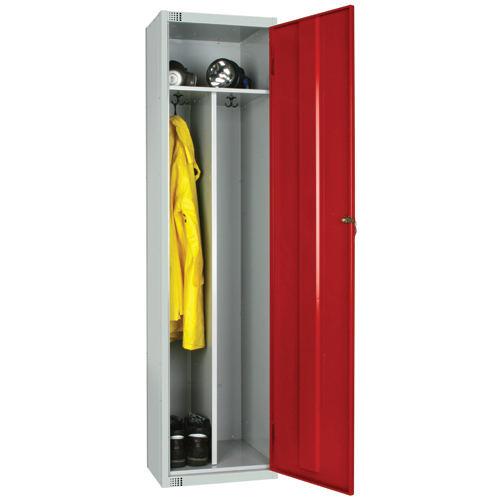 Made from solid steel, these lockers allow you to store your possesions and equipment in a safe and secure manner. Not only are they made for strong material they also are reasonably sized, allowing you to store them even in the smallest of places as they stack on top of each other saving you plenty of space. Clear door lockers provide a visible sense of security allowing you to see the contents of possessions stored in lockers. Our clear door locker range are welded to high craftsmanship standards, giving you a strong, safe and longlasting solution. The clear door is made from shatter-proof polycarbonate material allowing use in various envrionments inlcuding retail, warehouse and industrial sites. 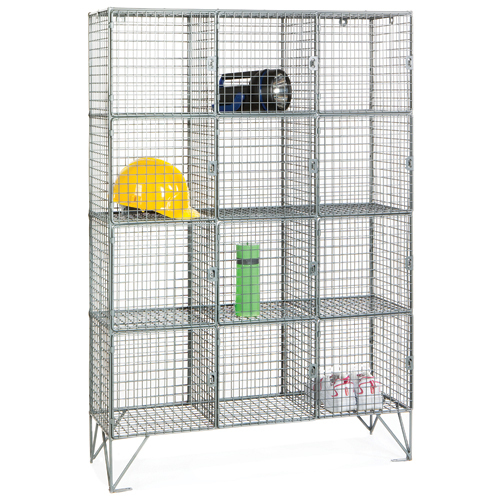 We offer a range of wire mesh lockers, constructed from zinc plated or powder coated steel wire mesh. Mesh lockers are a great option for changing rooms and general storage, providing visibility and ventilation. They are widely used as sports lockers because of their open design keeping away odours through good ventilation. Mesh lockers are available in a wide range of sizes and can be supplied with or without doors. Where visibility into the locker is required as well as the mesh lockers, we also supply lockers with transparent doors. This allows the contents of staff lockers to be monitored helping reduce stock theft. One increasingly popular range of lockers is our personal effects lockers. These provide small lockable compartments ideal for the safe storage of small personal possessions such as mobile phones, wallets, purses, handbags. 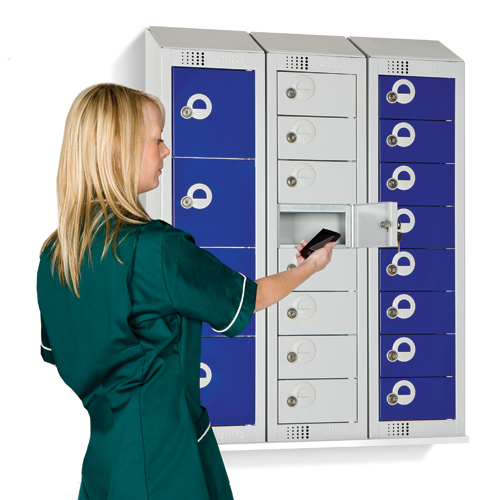 These are especially popular for storing mobile phones which cannot be taken into many work areas, the personal effects lockers are a great way to keep phones safe and out of the way. Supplied with or without power points our laptop and tool locker, enables items to be charged whilst safely locked away. Often used as tool lockers or for electronic devices such as laptop computers or tablets, the re-charge lockers can prevent theft and reduce the amount of trailing wires which can cause tripping hazards. Traditionally many schools have supplied pupils with storage lockers to hold possesions such as school bags, lunches, text books and sports equipment. These days not a lot has changed although the pupils are now storing gadgets such as laptops, tablets and mobiles phones. We manufacture and sell a range of school lockers featuring a range of sizes and colours allowing you to find the locker just for your needs. We sell plastic lockers, steel lockers and our own brand of Supertuff plastic lockers which are very strong and can be used for outdoor lockers. 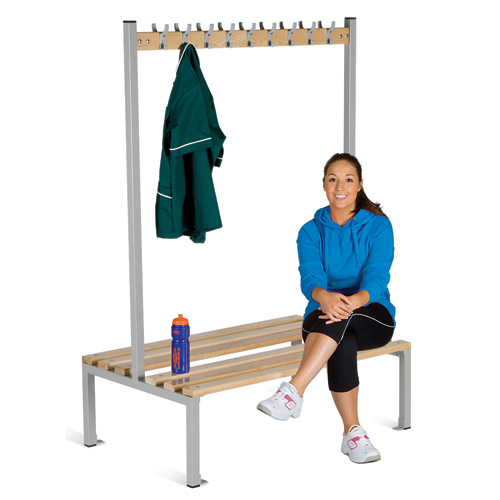 As well as lockers we supply an extensive range of changing room equipment. Including changing room benches, coat hooks and seating. Overall we provide a wide range of lockers to suit different environments including store lockers, changing room lockers, staff lockers, school lockers and gym lockers. Contact us today for more details on the range we supply.